A heart full, thanks giving. This year for Thanksgiving we mapped our hearts, calling forth the things, big and small, we are filled with gratitude for. As you can see, the six year old girl in our house had plenty of things she wanted to list, all good things too, I think. Who isn’t thankful for fairies, rainbows, and butterflies? Fun, family, and friends? My own heart was divided in much the same way as it is every year. The pillars, the foundation, the same. Those things I have vested most of my energy in are the very things that support me so well. In fact, besides the annual love letter to our CSA members which will follow, in looking back at my other Thanksgiving posts (2008, 2009, 2010, and 2011 three times) I could see that the trend holds true. The things I am thankful for only grow more deeply important to me each year, more deeply sustaining. The small parts might change some, but not even they do always. Delicata squash and arugula are still the two veggies that made the list, so seasonally delicious at this time of year, I can’t help myself. The things that have subtly changed this year are those growing children I live with, a year more into being who they are, a new age and stage for each of them. This year, it is the strong love of an eleven year old boy that I am especially blessed with, the goofiness now gracing our house more often than not from the eight year old boy , who also happens to give the best snuggles. The fierce opinions of a six year old girl challenging me to continue to make room for all the peoples of this home, thankfully accompanied by some fierce love and a big, big heart, not to mention stellar storytelling skills and a beautiful imagination. And there is the wonder of seeing the world through the two year old’s eyes, the joy of slowing way, way down and just being present with him. Love. Of course, the farmer is my never ending source of inspiration. I am eternally inspired by his gentle, caring nature, and thankful, always, for his never ending ability to make me laugh. And to make others laugh too. I am thankful for how genuine and lighthearted he can be. Sweet and good friends, the wood stove, all the children I know, new babies, gardens and canning jars, books, writing, music, sunshine and rain, all of it, everything. I am in love with life beyond measure. I can’t help but be thankful for it all. But it is important, like always, for me to say that I am truly, honestly, more than can really be conveyed, beyond words thankful for the support of our community for our farm and most significantly, the support of our farm members and the thanks they keep giving us. This was the first year where I feel like our faith was really tested. To be frank, there were times in the year we were imagining all kinds of different scenarios for next year, the first time we ever felt like we might eventually lose faith in farming itself if we didn’t change something. Maybe no farmer’s markets, maybe no CSA. We just weren’t sure it was working. We have calmed down a lot, and although we do know that we have to structure the farm according to its own unique characteristics, the one thing we were sure of in the end was that the CSA was the best part of our operation. And that was because of all of your thanksgiving to us. The love, joy, happiness, and yumminess you let us know our farm and food gave you. We realized, like always, that we are eternally grateful to have all of you in our lives. This mutually beneficial set up is really working. We are so, so thankful for the CSA model, our CSA members, and the immeasurable rewards we all reap from this one little (or big) part of our lives. Some things never change. The cornerstone for a thankful life is knowing those things that really matter, that really make the difference. Knowing them, being grateful for them, nourishing them so they keep on nourishing you. With that equation, a heart should be full and strong and ready enough to forge ahead through another year, able to take the good and bad that may come along in that course, without too much cracking as a result. The territories mapped out just enough to be sure of, with just enough open for the new things, big and small, that might need a spot too. That is where my heart stands. ← On Thanksgiving. I’m thankful for you. I want to map my heart! Thank you, blessings to you! Thank you Nancy! I am glad our veggies are part of your diet, I really do believe they are some of the most nutrient dense around, though I am sorry to hear of the reason. Here’s to strong and full and happy hearts and bellies!! I hope to meet you soon! 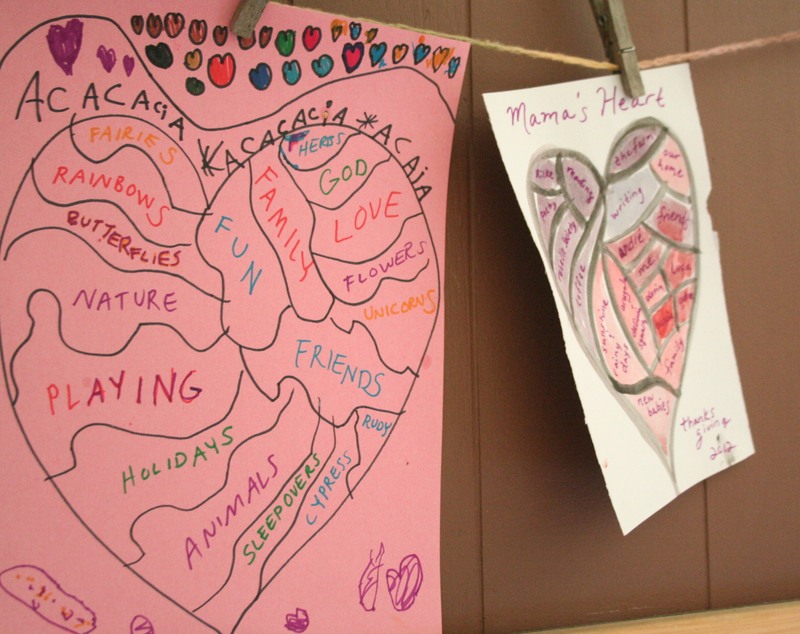 Heart Maps. What a nice idea!! And now may your hearts be merry and bright as we move into the Christmas season. My heart saddens when I am reminded our CSA is nearly over for this year, so will look forward to the new year! Thanks Jan! Your hearts too!